The year 2018 is off and running. How are you feeling about it all? Are you making progress toward a new goal? Do you feel encouraged that you'll get there? It's been a while since I've set New Years resolutions. Since becoming a mom, I've pursued goals and made plans in a different way. Instead of pinpointing specific things to achieve, I step back and look at the year ahead: What commitments, events and travel are already set? With this in hand, my husband and I brainstorm and insert doses of family fun, as well as time for personal priorities (ESSENTIAL: a long-overdue getaway for just the two of us) and, for me, creative development. What may look like busy work or frivolous tasks to some are pure adventure to me. Creating. Learning. Connecting. These are the things that defined my youth, adolescence and college years. These are the things that define me still today. 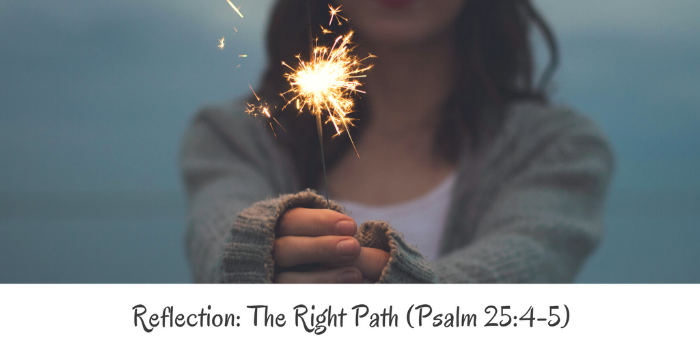 Psalm 25:4-5: Show me the right path, O Lord; point out the road for me to follow. Lead me by your truth and teach me, for you are the God who saves me. All day long I put my hope in you. Happy New Year to you, and may God bless your endeavors in His name - today and always.